Buy Paul Vincent a Coffee. ko-fi.com/astronomicon - Ko-fi ❤️ Where creators get paid by fans, with a 'Buy Me a Coffee' button. British SciFi writer and author of the epic Astronomicon scifi series. Would love to write full-time but, for now, it's just a hobby. Welcome to my Ko-fi Page. 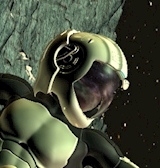 If you enjoy my science fiction writing, please consider supporting what I do. Thank you. Secured Payments. Support goes to Paul Vincent's account. My writing laptop is almost 4 years old. General wear-and-tear, a broken USB, creaky hinge and decreasing battery life are all indicators that it's not going to last much longer. I fear that one of these days, it's not going to switch on. Upgrade Paul Vincent to a yearly Gold Membership with a one-time payment.